I created this thinking of you easel card using Basset Girl from Karen's Doodles. The base of my card is spring breeze cardstock. I finished two of the corners by punching along one edge of a strip of purple cardstock using an eyelet lace border punch and then fitted it to the card by wrapping the edges around the back. I colored the image using crayola colored pencils and cut it out in a circle. I inked around the edge of the circle using a purple chalk ink pad and then backed it in purple cardstock. I cut it out using scalloped scissors (or as my 7year old would call them "crazy scissors"). I cut the sentiment "thinking of you" out and inked the edges using the purple chalk ink pad and then backed it in purple cardstock. I added two white heart pearls to the sentiment. I then added a paper rose that I made using a retro flower punch and two swirls of white pearls on each side of the flower. Each swirl has eight pearls. The base of the bottom of the card is also spring breeze. I punched a strip of purple cardstock using an eyelet lace border punch. I added a green and white dotted ribbon to the top of the purple cardstock and added white pearls along the ribbon (11 total). This is a wonderful easel card! I love the colors you chose and the image is adorable. Thank you for joining us at Stampin Sisters in Christ! What an adorable image, I just love the hat! Fabulous card Mary. Thank you for joining us at Stampin Sisters in Christ. This s cute!Lovely spring colours and fabulous punch and pearls! Thanks for playing our 'Green for St. Patrick' challenge at Delicious Doodles, and good luck! thanks for playing with us at stamptacular sunday this week. Such a pretty easel card. Thanks for joining us this week at SS! What a pretty card! Love your color combo! Thanks so much for joining us at Stamptacular Sunday and at Card Makin' Mamas this week! This is adorable, love the image and your design. 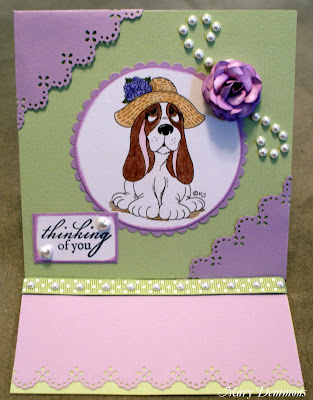 Gorgeous, thank you for joining us at Creative Inspirations in our easel card challenge. Good luck. This is just so darling, this little guy just makes me smile! Thank you for joining us this week at the Catch the Bug Challenge Blog for this fun scallops challenge! I hope you join us again soon!